If I could I would have the music from the theme song playing with this blog, however I am not that technologically inclined yet. I will eventually learn how. If someone wants to leave me a comment and tell me how easy or hard it is that would be wonderful. 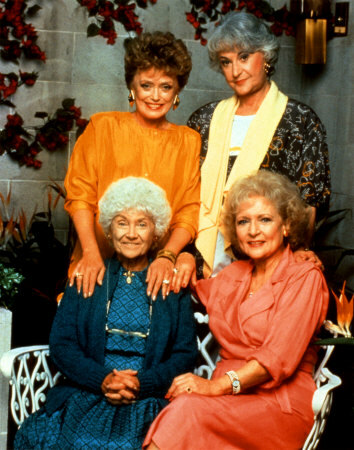 The Golden Girls remind me of being a little girl sitting on my grandmothers lap sneaking sips of her coffee when the show would come on her big wooden t.v. me asking a million questions, because at the time I didn’t understand half the things on that show. Her trying to watch, remaining calm and answering to the best of her ability. She would always be doing something else while watching t.v., whether it be crocheting, knitting, stitching up someones pants, and making her lists for the following day. I was always amazed at all the things she could do, and made them look so easy. I have been missing her so much lately, and one of the things that kind of makes me feel a bit better is watching golden girls. All of my grandparents were awesome people. I wish I could bring them back if only for a day to tell them all things I never got to say, and just get that one last hug. I was at church for the Christmas program service. I just all of a sudden got this weird feeling, and started sobbing right in the middle of all this. The pastor kind of noticed and stopped what was going on to have a prayer where they call people who need prayers to go to the front. I waited for a moment, then without hesitation went up. I didn’t even know why I was sobbing. I went on through out my day which included my fathers family’s Christmas party. When I returned home I received a phone call from my aunt Becky letting me know that she had passed away that morning. I just could not function. My friends came over trying to cheer me brought me silly stuffed animals. A taco bell dog that says strange things and a tigger that did weird stuff. The night of the viewing or wake depending on what you call it I sat in the front row and didn’t mutter a word. I just looked in at her, in disbelief. Trish came over hugging me trying to have small talk and cheer me up. I tried to smile and not get upset. Before the funeral I cried and cried and cried some more I excused myself to the bathroom to do so. I put a picture of Trish and I sitting on a swing together in with her to have for eternity. I held her hand one last time before we had to be seated. I still remember the very last thing she said to me. After coughing horribly to the point where she had gotten sick I was helping clean her up she told me “It is too hard living like this, it’s my time, I have lived my life. You don’t need to cry.” I told her not to talk like that and I am going to cry. She said”I know babe” before I left that day I gave her one of those hugs where you dont want it to end. She had always been a staple in my life. She was always there for me. She taught me many of the things I know and was there for everything important in my life clear up until right before she died. A year ago I lost the one person I had left in my family that I knew beyond a shadow of doubt would always be there no matter what. He went in the hospital thinking he had the flu. He started out looking perfectly fine the first day he went in. He found out he had stomach cancer. The next day he looked really bad hardly waking up. I went in and sat with him. Elaine, Trish, and I think a couple of other people were there, He woke up looked right at me and told me to get over there. Held my hand said hello my beautiful girl you need to take care of yourself. I said I am. I told him he needs to get better. Hes said he didnt know if he was gonna kick this one. I waited for a bit then went to sit down. When I left the room to take my turn in the waiting room he yelled out the door for me to take care of myself. My aunt Elaine came chasin me down to let me know what he said and I told her I heard him trying not to cry. I knew then he wouldnt live through the week. When I returned home I cried and cried and told one of my friends that I knew. The next day I went back to visit him, he was unresponsive and didn’t move the entire time. I could not help but to break down and cry. That hit me hard. I didn’t want to do anything and everyone around me just kind of knew. People constantly were making sure I was ok. I don’t think that my family has ever paid so much attention to me as they did that day. My mother came over to make sure I had plenty of clothes to wear to the upcoming events. At the wake I was fine until my mother being a pain in my rear who wanted me to deal with stuff made me go up and look in. I could not stop crying. I went to drive home a drive that I had done millions of times and I got lost. When I got home I sat outside for a long long time just wondering how this could have possibly happened. I went and saw his grave the other day. I still wonder the same things. Previous PostMy little cornerNext PostIn days of old..